SHANGHAI (AP) No one ever can tell what’s going through Dustin Johnson’s head by looking at him. His expression was the same at the HSBC Champions when he was building a six-shot lead on Saturday and when he was losing it on Sunday. Leave the emotions of the surreal moment to Henrik Stenson. Johnson sure didn’t have many answers. He left the 18th green with the same stoic expression that he had on the first tee when he began the final round with a six-shot lead. Instead of going to the trophy presentation on the third-floor balcony of the HSBC suite above the 18th green at Sheshan International, Johnson went into the scoring room to sign for a 77. It was his highest closing round with the 54-hole lead since his 82 at Pebble Beach in the 2010 U.S. Open. As collapses go, this was shocking for a couple reasons. Johnson had made 22 birdies through three rounds. He had none on Sunday, and he wasn’t particularly close. The biggest putt he made all round was a 6-footer on the par-5 second hole to save bogey after driving into the water. Even more surprising is that Johnson is No. 1 in the world with four victories this year. He is such an imposing figure that a trio of major champions behind him – Stenson, Justin Rose and Brooks Koepka – figured they were playing for second. ”Try and win the other golf tournament,” said Rose, who shot 67 and won the real thing. As great as Johnson is – he is No. 1 in the world for a reason – this is happening far too often. Pebble Beach was the first time Johnson played a final round with the lead, by three shots over Graeme McDowell. That was gone when Johnson made triple bogey on the second hole and then lost a ball in the bushes trying to drive the third green. Johnson learned that day to slow down. There really hasn’t been another bad collapse since then. He had a two-shot lead at Doral in 2011 and finished second, although the seven players within three shots of him were all among the top 31 in the world ranking. The other times, he was tied for the lead. 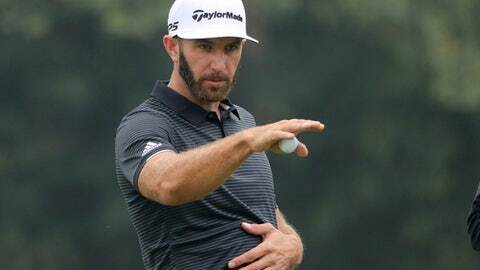 Even so, for someone who has piled up 16 victories, one major and five World Golf Championships in 10 years on the PGA Tour, Johnson has not established himself as a great closer. His record with at least a share of the 54-hole lead is hard to measure. By the book, he is 7-6, but three of those victories were only three rounds because of rain at Pebble Beach in 2009, high wind at Kapalua in 2011 and a hurricane at The Barclays in 2013. Throw those out and he’s 4-6. Johnson spoke just long enough Sunday to acknowledge some of the mistakes that led to his downfall, mainly chunking a short iron for his second shot on the par-5 14th that caused him to scramble for par, and chunking another one on the 15th that led to a plugged lie in a bunker and a bogey. ”That cost me two shots there,” he said. And then he made bogey on the 16th – he made eagle there when he won the HSBC Champions in 2013 – by hitting his tee shot to the left into a buried lie in Bermuda rough and leaving himself such a bad angle that he could only ask for perfection on the next shot. He missed by a yard. Johnson is not the first No. 1 player to lose a six-shot lead. Greg Norman had what remains the most famous collapse because of the stage, Augusta National in 1996, when he shot 78 and finished five shots behind Nick Faldo. Bobby Cruikshank shot an 80 to lose the 1928 Florida Open. Hal Sutton shot a 77 to lose the 1983 Anheuser-Busch Classic. Another player to lose a six-shot lead in the final round was Gay Brewer. He closed with a 73 in the 1969 Danny Thomas Diplomat Classic and was the victim of an Arnold Palmer charge. The other two on that dubious list were Sergio Garcia in 2005 at Quail Hollow and Spencer Levin in 2012 at Phoenix. If there is cause for concern with Johnson, it’s his putter. He switched models when he won the BMW Championship last year and used that putter through three straight victories in the spring that took him to No. 1. He switched back to the putter that he used in 12 previous victories, including the U.S. Open. He brought a different putter with a mallet head to China, and that lasted one round. He took possession of a fourth putter 15 minutes before he shot 63 on Friday. Will this collapse scar Johnson? Probably not. Johnson has a short memory, one of his many strengths. Just don’t expect anyone chasing him on Sunday to think they’re playing for second, no matter how large the lead.